The climate bill put forward this week by Waxman and Markey lays out targets that are ambitious enough to make a significant contribution to the global effort to avoid the most dangerous consequences of human-caused climate change. In a previous post I showed that Waxman-Markey, on its own, won’t achieve long-term climate goals (such as stabilizing atmospheric CO2 levels at 350-450 ppm or limiting temperature increase to less than 2°C). No one country can reduce emissions enough to achieve such goals. They can only be realized through global cooperation. But that should not be taken to mean that Waxman-Markey (or any other proposed US emissions reductions policy) is insignificant. The graph above shows another way to look at the importance of US emissions reductions. I used the C-ROADS simulator to compare two scenarios. In the first scenario, shown in green, the rest of the world takes immediate and vigorous action to reduce greenhouse gas pollution, starting now and reducing CO2 emissions from fossil fuel use to 90% below 2005 levels by 2050, and also acting vigorously to reduce emissions from deforestation as well as emissions from other greenhouse gases. In this scenario only the US fails to act. The large gap between “Business As Usual” in black and this scenario in green, represents the potential contribution to climate stabilization of all countries outside of the US. The second scenario, shown in purple, is the same as the first, except that, in this scenario, the US succeeds in meeting the emissions reduction targets set forth in the discussion draft that has been circulated about the Waxman-Markey legislation. The difference between the green line and the purple one could be thought of as the difference that the Waxman-Markey legislation could make for the long-term climate. 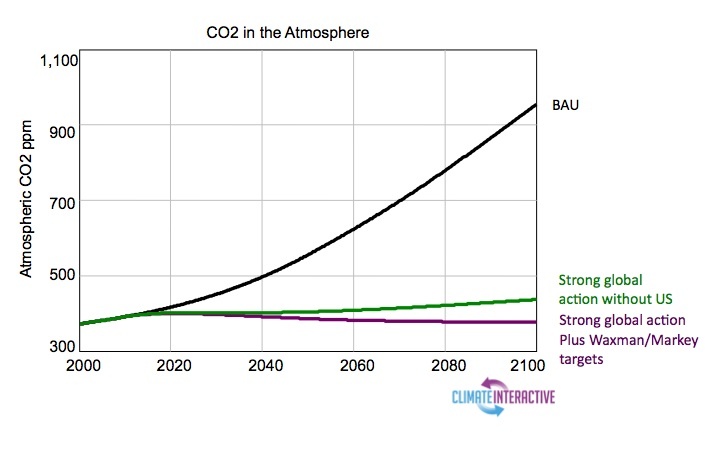 By 2100, this difference amounts to about 60 ppm CO2. In a world of uncertain thresholds and tipping points, where scientists cannot tell us with certainty how far we can push the our planet before warming begins to feed upon itself, that’s a difference that makes a difference. And it’s a difference that every US congress member should hear about, from their constituents. For more background on the C-ROADS simulator, or to see the conclusions of the scientific panel that recently reviewed it, visit here.